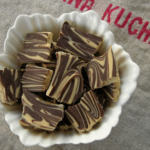 Tiger Butter Candy is a sweet treat made with white chocolate, peanut butter, and semi-sweet chocolate. Line a jelly roll pan with aluminum foil (non-stick foil works best). Melt white chocolate and peanut butter in a bowl over simmering water (double boiler) until melted and smooth, stirring to blend. Spread mixture evenly on the foil-lined pan. Melt chocolate chips in a small bowl in the microwave on high at 15 second intervals. Stir after each interval. Melt until smooth and be careful not to overheat or burn. Drizzle chocolate over peanut butter mixture. Using a chopstick or thick food pick, swirl together to make stripes. Chill for at least 1 hour to harden. Break into pieces to serve.